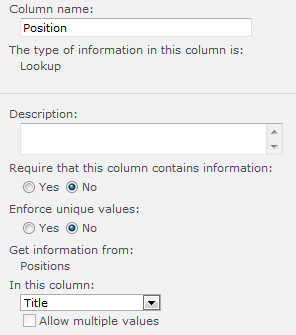 When you add a Lookup Column to a list the linked item’s display form will automatically be linked to the column wherever it shows up in a view. Generally, this is pretty awesome behavior since it gives more detail on demand without us having to do anything. Sometimes, however, these links can get in the way. This is especially true when you have more than one lookup column in a view or when you don’t want people to get confused about which link to click. 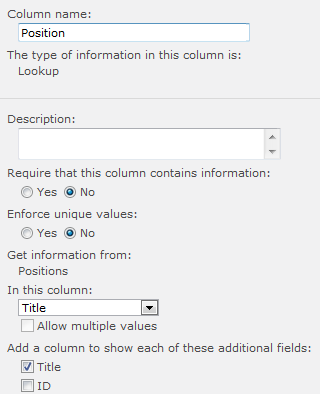 In SharePoint 2010 you can include additional fields with your lookup. So for this workaround we’re going to simply have the same reference column also be an additional field for the lookup. This allows us to choose the additional field for our view. Got it? How about an example. That’s part of our view for our list. So, which link do you click on? The Position link will open the display form for the Positions list item Associate Manager. The Job Type link will open the display form for the current list item. And my head just exploded. As you can see, this takes care of our problem. The user is still only presented with the one dropdown when using the edit/new forms to pick the position and our view now has no hyperlink to the secondary list’s item display form. But what about that stupid column name? Of course, editing the columns or messing with additional views can get confusing when columns names look exactly the same – so use at your own discretion. Often you can just rename the Title column to whatever you want to have that functionality and you’re good to go. However, sometimes you want the link and/or menu on a different column. Unfortunately, this isn’t an option in the View editor within the browser. Fortunately, it can easily be done in SharePoint Designer without having to mess with XSLT at all. Switch to the code view and scroll down to the purple section (you can only edit the yellow highlighted text in advanced mode – which we do NOT need to do here). 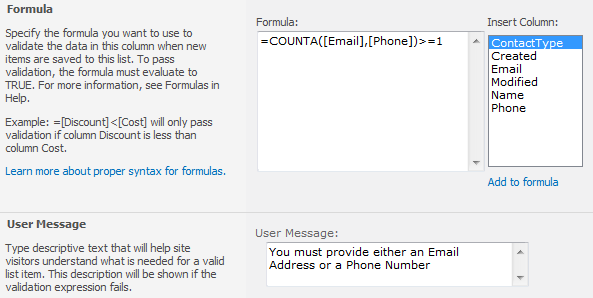 In the above example, SomeField1 will now have a hyperlink that will open the display form for the list item. In the above example, SomeField1 will now have a hyperlink that will open the display form for the list item and a drop down menu for choosing actions. 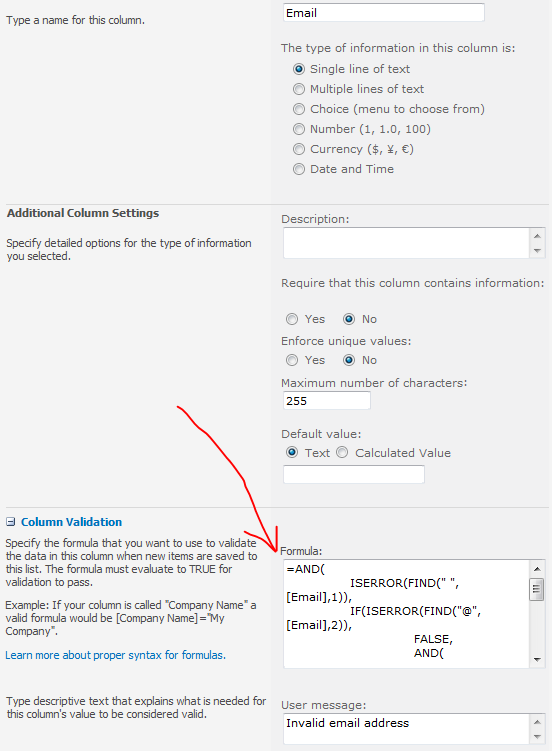 The column validation feature of SharePoint 2010 lists can save you a lot of headache and prevent problems before list items are ever added. I recently added a Phone column to a custom list and wanted to validate it was an actual phone number. Unfortunately, my handy dandy regular expression that I always use in .NET wouldn’t work here since you are limited to using the calculated field formulas (Excel). Some quick searching turned up Robert Freeman’s blog where he gives a great formula for ensuring phone numbers are entered in the form (###) ###-####. This worked perfectly for me. However, I wanted to make sure I understood it so I broke it out into logical sections and went through it. To get this working in SharePoint, just copy the above and do a find and replace on [Phone] with whatever your column is named. SharePoint will remove all the extra line breaks and make it ugly again as soon as you save it. 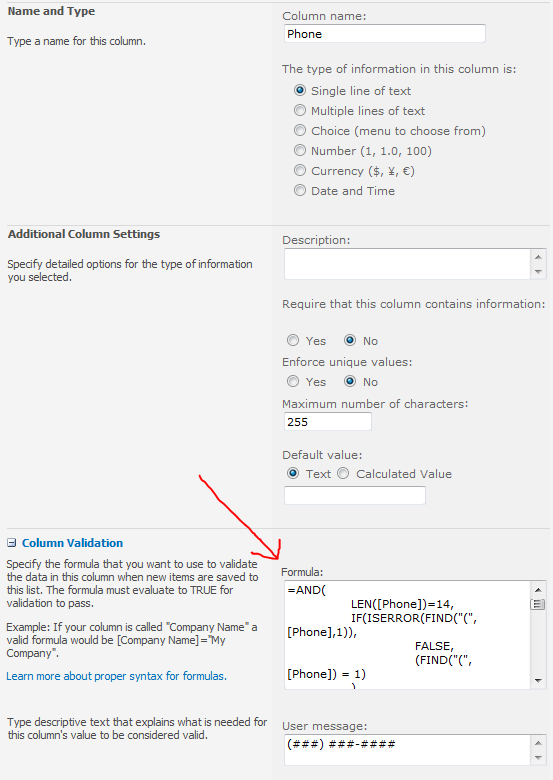 Column Validation works on the simple principal of returning true or false. So Freeman starts his formula in line 1 with an AND statement. An AND statement allows you to pass multiple conditions (also returning true or false) and will return true only if all the conditions return true. This is a great way to ensure that multiple checks all validate correctly. The first check in line 2 uses the LEN function to ensure that the total length of the entry is exactly 14 characters (10 numbers, 2 parenthesis, a space, and a dash). This is a slight improvement over the original since any entry with a properly formatted phone number at the start could be used. This prevents someone from adding extra numbers or characters. The second check in lines 3-6 uses the FIND function to see if the first character is the (. It’s wrapped in an ISERROR check because the FIND function returns an error if the string is not as long as the start number (in this case, empty) or if the text wasn’t found at all. So if it wasn’t found (error), we return false. If it was found then there is a check to see where it was found (FIND returns the character number where the search text was found). In this case we want it in position 1. The next 3 checks in lines 7-18 are essentially the same as above just looking for the closing parenthesis in position 5, a space after the parenthesis in position 6 and a dash in position 10. In line 19, a check is performed to ensure that the number portions of the entry are actually numbers. The 3 sections of numbers are put together using a CONCATENATE function and are multiplied by 1. If the multiplication fails (because the string can’t be converted to a number) the error condition is caught by the ISERROR wrapper and FALSE is returned. An ISNUMBER function would have worked here as well. If it’s a number, then some additional checks are performed in a new AND clause beginning in line 21. Line 22 uses the CONCATENATE function to ensure that not only are the numbers numbers, but also that they aren’t all zeroes. Lines 23-25 use the MID function to ensure that the area code and the prefix don’t equal 911 and that the prefix also doesn’t equal 555 since these would not be valid numbers. I was tasked with finding all timer jobs that ran in a given time period. 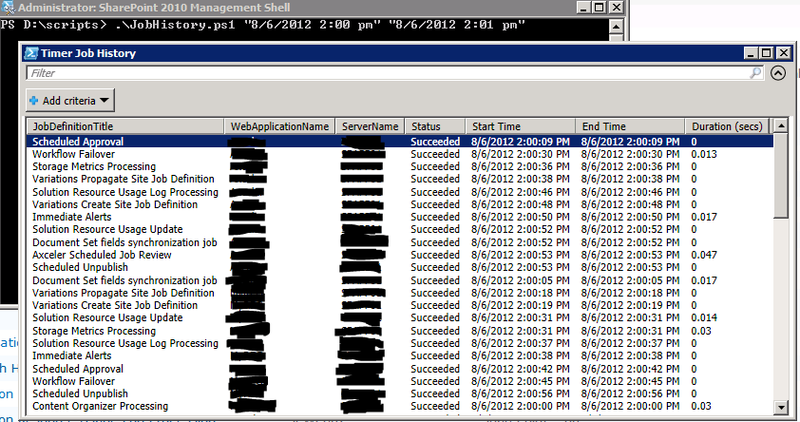 Some quick searching turned up a pretty cool solution by Glyn Clough using PowerShell. I took his script and modified it some to account for UTC times and it works great. Although I’m presenting my modified script, the bulk of the work was done by Glyn and I’m really just tweaking it a little.
} | Out-GridView -Title "Timer Job History"
Running it this way will return the entire history for the current day starting at midnight. This is especially helpful if you’re just trying to find the most recent history since this will give you the full history starting at the specified date/time to now. Doing this will return all history entries for the given range. The date/time parameters can be entered in a variety of ways since powershell is converting the string to a date you can enter the date/time in a format that matches your culture/locale. The results are funneled to a GridView which requires the Windows PowerShell Integrated Scripting Environment (ISE) to be installed. On a server this is as simple as opening Server Manager, selecting features, Add Features, then choosing the Windows PowerShell Integrated Scripting Environment and installing (This did not require a restart). There are many benefits to using the GridView. The best is the filtering, but I also like the sorting and copy/paste functionality. I often filter on job status or sort by duration to catch problem jobs. Then I can copy those rows and paste them directly into Excel if needed. The above script also outputs histories for every web application (And will immediately show the GridView when the first is done and then slowly add the remaining ones). This could be changed by modifying the above script and adding a parameter, but this was unnecessary for me. You can also use the GridView filter to show only the web application you need.